network expansion, as well as customer focused product investments. Emirates scaled up its fleet in 2016 with the addition of 36 new aircraft, consisting of 20 A380s, 16 Boeing 777-300ERs, while retiring 29 older aircraft. The airline concluded the year with 255 aircraft in service, with an average age of 5.0 years, significantly below the industry average of over 11 years. Keeping its fleet young not only minimises Emirates’ overall carbon footprint, but it also enables the airline to put the latest products and services onboard its aircraft. In April, Emirates placed an order for two additional A380 aircraft, taking its total A380 order book to 142, cementing its position as the world’s largest operator of the popular double-decker aircraft. In November Emirates became the only airline to operate an all Airbus A380 and Boeing 777 fleet, further elevating the passenger experience onboard through a modern, state-of-the-art wide-body fleet. Emirates also began taking delivery of its newest generation Airbus A380 and Boeing 777-300ER aircraft. The new Airbus A380 has several notable new features including an enhanced seat configuration in Economy Class, and a higher ceiling in the Business Class Cabin for a more spacious feel. Emirates’ new Boeing 777-300ERs delivered from November also feature the airline’s new Business Class seat. Emirates unlocked seven new passenger points and one cargo destination in 2016, rounding off the year with 154 destinations in its global network. The airline’s new passenger services in 2016 were: Cebu and Clark in the Philippines, Yinchuan and Zhengzhou in China, Yangon in Myanmar, Hanoi in Vietnam, Fort Lauderdale in the US and cargo-only destination Phnom Penh in Cambodia. Emirates also expanded its A380 network to 44 destinations with the addition of 8 new points. Today it operates the longest A380 service in the world from Dubai to Auckland, and also the world’s shortest A380 service to Doha. During the year, Emirates also led one-off A380 services to two destinations – Chicago in the US, and Amman in Jordan. Emirates was named World’s Best Airline 2016 at the Skytrax World Airline Awards, and in the past year, the airline continued to work hard to deliver memorable experiences for its customers. The airline invested in a series of product developments and service enhancements, both in the air and on the ground. This year, Emirates unveiled its enhanced Business Class seat on its Boeing 777 aircraft, taking comfort and design to new heights. Amongst the most recognisable features of the new seat is the pitch of 72 inches that can be moved into a fully flat 180 degree sleeping position, a personal mini-bar, as well as one of the industry’s largest personal TV screens at 23 inches with the ability to stream personal mobile content. Emirates continued to strengthen its in-flight entertainment (IFE) offering. With the airline now operating an all-Airbus A380 and Boeing 777 fleet, this means customers on all Emirates flights can access on-demand entertainment with up to 2,600 channels of movies, music, TV shows, games and more, to choose from. In October, Emirates signed an agreement with Thales to equip its Boeing 777X fleet with the Thales AVANT in-flight entertainment system, debuting in mid-2020. Reflecting the increasingly connected digital lifestyle, over 8.8 million Emirates passengers connected to Wi-Fi on board in 2016. In addition, more than 400,000 phone calls were made in-flight, and 1.7 million sms messages were transmitted by passengers. Emirates also partnered with VOYA luxury spa products for its passengers to enjoy in its signature shower spa, dedicated lounge bathrooms and First and Business Class washrooms. In addition, Emirates and luxury Italian brand Bvlgari redesigned the airline’s exclusive amenity kit bags by giving them a sleek, modern look. So far in 2016, 2.75 million First and Business Class amenity kits have been distributed on Emirates flights. Focusing on seasonal and regional flavours, Emirates also unveiled a new Japanese menu for First Class and Business Class passengers during the year. For the festive season, a special menu was introduced across all classes to capture the flavours of the holidays. In Economy Class, Emirates launched the world’s first interactive amenity kit to provide a more comfortable travel experience. The stylish new amenity kits utilised augmented reality (AR) technology to unlock immersive content on mobile devices. Young travellers continued to be delighted with the second range of onboard toys, and more than 3 million toys have been distributed so far this year. On the ground, investments continued in upgrading the lounge experience. Emirates this year completed a US$ 11 million refurbishment of its Business Class lounge at Concourse B in Dubai, which now includes a barista experience, a health hub with Voss water, and an exclusive Moët & Chandon champagne lounge. The airline also extended its dedicated lounge network with the opening of its lounge in Cape Town. Emirates also began offering customers greater flexibility to check in for their flights by extending check-in in times from 24 hours to 48 hours. 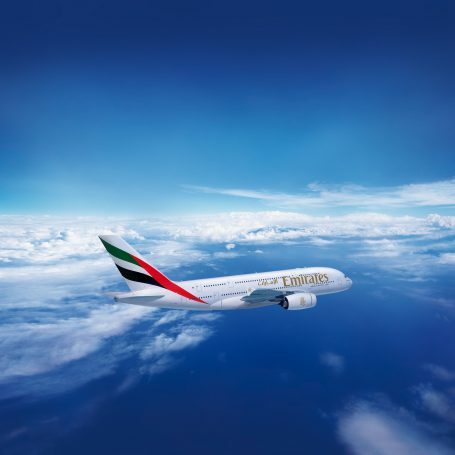 Building on the strength of its loyalty programmes, the airline’s frequent flyer programme Emirates Skywards marked a milestone of 16 million members by launching Cash+Miles. The innovative flight redemption programme allowed members to redeem a combination of cash and Skywards Miles on any Emirates flight, reducing the cost of tickets and making any seat available for members. The airline also revamped its corporate loyalty programme, Emirates Business Rewards, delivering a more competitive and easier redemption process for flights as well as upgrades at any time for businesses. 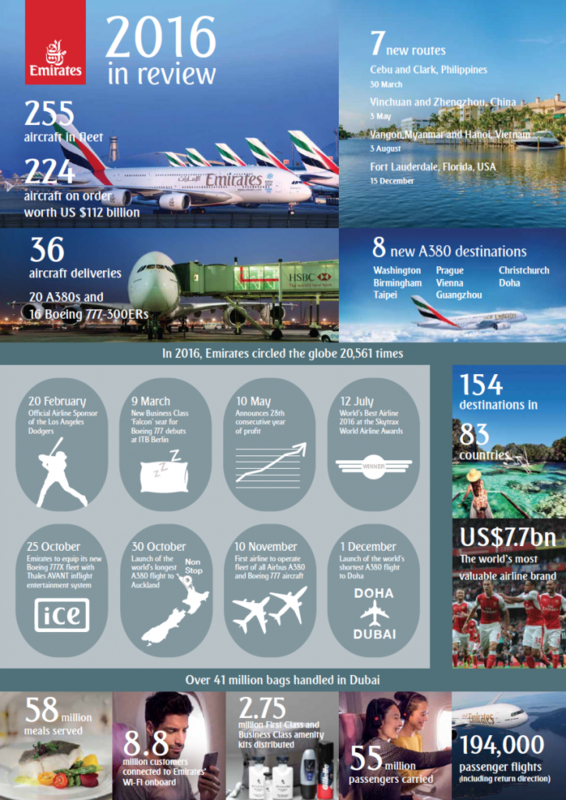 Emirates topped The Brand Finance Global 500 report as the world’s most valuable airline brand in 2016, with the airline’s brand value growing more than 17% to US$ 7.7 billion. Throughout 2016, Emirates continued to use sports, musical and cultural events as a platform to engage with its customers and fans. In January, Emirates teamed up with Boeing to sponsor ‘View from Above’, one of the largest aerial filming projects ever conducted using unmanned aerial vehicles (UAVs), commonly known as drones. Filming was conducted by 13 drone pilots in 18 destinations on five continents capturing never before seen footage of popular destinations. In February, Emirates made its first foray into Major League Baseball as the Official Airline sponsor of the Los Angeles Dodgers. A few months later, Emirates Cabin Crew shared a fun safety-inspired demonstration with the help of Dodger legend Orel Herscheiser. In April, the airline celebrated the spirit of cricket with a witty, Bollywood inspired ‘Welcome onboard’ demo at the ICC World Twenty20 Final between England and West Indies, entertaining a packed stadium of 66,000 fans. In October, Emirates returned with Hollywood actress, director and producer Jennifer Aniston for another fun global advertising campaign that showcased the iconic Emirates A380. In a joint effort to promote reading and literacy, Emirates partnered with Google in an initiative called ‘Celebrating Arabic Reading’. This initiative aimed to reach millions of smartphone users and make Arabic books more accessible with unprecedented discounts of up to 90% on online books at the Google Play Books store in 9 countries in the Middle East, and support the UAE’s Year of Reading. So far, the initiative has reached over 120 million people in the region. In November, Emirates teamed up with Dubai Miracle Garden to construct the world’s largest floral installation through a life-size version of the Emirates A380, covered in more than 500,000 fresh flowers and living plants. Over 200 people worked for 180 days to build, layer and mount the foliage on the 30 tonne steel structure. The aircraft structure even includes moving engine fans and other key design features that capture the essence of the original aircraft design. *Catering figures cover meals loaded at Dubai International only. This does not include meals loaded at other destinations.